Copy General is now FSC and SFI certified. 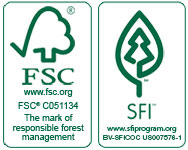 We can add the FSC or SFI labels to your printed projects, just ask us how! The Copy General team has been trained, audited, and has completed stringent ISO compliant certification process in order to get our official Forest Stewardship Council (FSC) and Sustainable Forestry Initiative (SFI) Chain-of-Custody certificates. The certificates allow Copy General to reproduce the FSC or SFI label on its printed materials, demonstrating to you and your clients that the paper used to print your project has been handled and transported only by companies adhering to FSC and SFI standards. Many of our stocks contain a percentage of post-consumer recycled content. We even have recycled content stocks for our wide format color printer. If requested we will gladly special order and run your project on 100% recycled stocks. Copy General is committed to conserving as much energy as possible within our locations. We have a lot of equipment and computers and we power them down every night and often only plug-in and power on machines as needed. Our east coast production center was recently remodeled to utilize natural light and our massive production floor is made completely of recycled materials.